Intertops Casino has added two new slot machines to their incredible selection of casino games just as their Jackpot Pinatas jackpot – the largest online progressive jackpot open to US players – goes over $1,500,000. The two new games from RTG feature free games and bonus rounds. Shopping Spree II is a sequel to the hugely popular Shopping Spree progressive jackpot slot machine. It recreates a lavish shopping experience catering to both the bargain seeker and the high-end shopper. Free games and bonus rounds give players maximum playing time for their money. The tornado-themed Triple Twister, where Weather Vane symbols trigger free games, has a Win Win feature that gives players a special bonus if their win from the main round is less than ten times their betting amount. Nearly two years since its launch and no big jackpot winner yet, the Jackpot Pinatas progressive jackpot went over $1.5 million on Tuesday. It continues to be the largest progressive jackpot available at online casinos that accept US players. There are two other million dollar jackpots begging to be won at Intertops Casino. The Aztec’s Millions jackpot was hit for $1.2 million just over a month ago but since it was reset to $1,000,000 it is already over $1.2 million. Meanwhile the jackpot that both the Midlife Crisis slot machine and the original Shopping Spree game are tied to is quickly approaching the million dollar mark. Intertops may be one of the world’s first online casinos but it was their sportsbook that took the very first online wager more than eleven years ago. Intertops sportsbook is currently running a Super Bowl Contest and featuring a wide range of NFL football betting propositions. 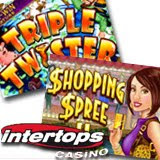 Intertops Casino features more than 300 instant-play and download games including 3 and 5 reel slots, multi-hand video poker, and traditional casino favorites from 3-Card Rummy to Blackjack, Roulette and Keno. Intertops is known as one of the most reliable and trustworthy online casinos in the world and they continue to earn their reputation for quick, hassle-free deposits and withdrawals and excellence in customer service. Thanks guys, keep up the good work! I am quite impressed with your level of customer service. Best. Product. Ever!